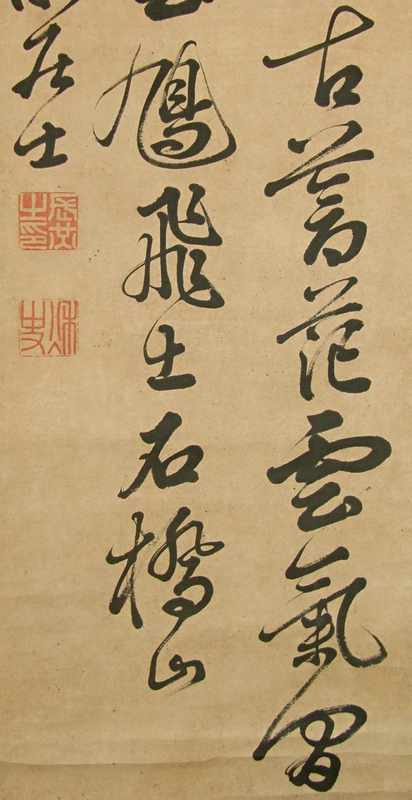 Title" Kanji Poem for Ishibashi-Yama "
Chirographer, Kanshi poet, loyalist in the last days of the Tokugawa Shogunate. Sanshu was born in Bungo Province (present Ohita Prefecture) as a son of a doctor and also Kanshi poet. Sanshu learned Kanji poem and other studies under Hirose Tanso. Though, when the war between the Tokugawa Shogunate and the Choshu Domain began, Shashu participated in the Kiheitai army of the Choshu Domain and battled against the Shogunate in various locations. After the Meiji Restoration in 1868, he served the new government until 1878. After the resignation, Sanshu took life easy by composing Kanji poems and depicting pictures. 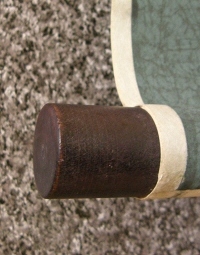 This scroll may have been re-mounted. There are spots, stains and folds to some extent. The drawing part is a little foxed as it was drawn years ago. A Kanji poem regarding Ishibashi-Yama is written in good form. Ishibashi-Yama is well-known place in Japan where Minamoto no Yoritomo (1147-1199, The first Shogun of the Kamakura Shogunate) raised an army.